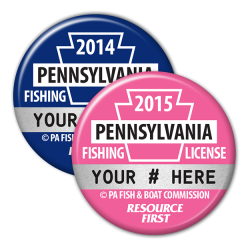 In order to purchase a PA 2015 Pink Button you must currently have a valid current year PA fishing license that allows you to fish all year long. In order to purchase a PA 2014 Vintage Button you must have purchased a current year fishing license button from the Pennsylvania Fish & Boat Commission or any of their outlets. If you have purchased a current year button you may order any past year buttons available. To order a current year button or a fishing license from PFBC click here.